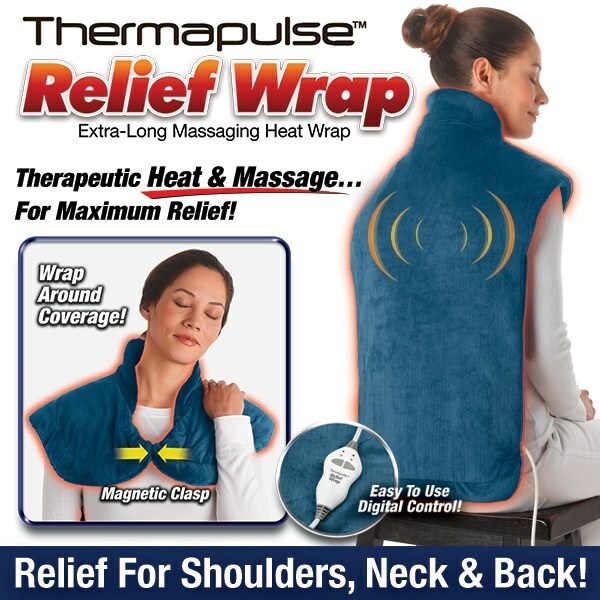 Thermapulse Relief Wrap combines soothing relief of heat and massage in a cozy, plush wrap. Relief Wrap is extra-long so it covers your entire back. Relief Wrap is the neck, shoulder and back heat wrap that soothes away tension and helps ease achy muscles and joints. The Relief Wrap unique design is shaped to perfectly target the neck, back and shoulder areas. The contoured fit gets to those hard-to-reach areas! The large wrap, with lightly weighted edges and a magnetic clasp, ensures full coverage and a snug custom fit that stays in place. Relief Wrap combines innovative heat therapy with luxurious micro-plush fabric to surround you with warmth and soothing comfort to melt away tension! You can unwind and get spa-like relaxation right in the comfort of your own home! The 2 heat settings and 4 massage levels lets you customize your therapy based on the level of intensity you need to start feeling better! Simply turn on Relief Wrap to your desired setting and receive a relaxing therapeutic heat massage directly to the area of stress and strain for maximum relief! The Relief Wrap 9 ft. long cord and digital LED controller allows the freedom of movement so you can sit or lay down and use it anywhere. Perfect for home or office. The 2-hour Auto-off feature lets you rest assured you can leave it on as you rest and relax. Heat therapy increases blood flow to the sore areas of your body causing muscles to relax and healing to happen faster. It helps loosen muscles, sooth achy joints, reduce swelling, stimulate blood flow and work away stiffness and tension. This is a great product. It&apos;s amazing how well it works and helps. Works great, and the vibrating massage helps allot with my back. haven&apos;t used mine yet&apos; but my bother can&apos;t stop taking about the one i gave him. Was looking forward to using this but it is ineffective. Not worth the money. Very soothing on sour neck and back. Helps with arhrits pain. Highly recommend. My wife found this very helpful for back and shoulder pain. Now sending one to my daughter. I love my relief wrap, I wouldn&apos;t be without it, I have a bad back and I use it daily. I even bought one for my husband and an extra one for travel. This is the BEST Heating pad ever, and I&apos;ve had many. Thank you Relief Wrap. My granddaughter has frequent backaches so I ordered the relief wrap fr her. She LOVES it and uses it just about every night. I dont use the massage much, but the heating from neck to back is wonderful. My neck and shoulder ache often and when I use the wrap it relieves the pain & I feel much better. This was my Mom&apos;s favorite Christmas gift! Finally a heating pad that is the right size to really help both of her sore shoulders! Provides warmth and vibration and simply relaxes you. Fell asleep with it on and after a couple of hours, it turned itself off. Fantastic product. I love it. I love it! !The wrap even shuts off automatically I fell asleep on it the other night and was glad to see that feature. Thank you to whomever came up with this idea.